A nightshirt and shorts from the wardrobe of Denise Poiret reintroduce one of Poiret's earliest interests, the simple forms of classical dress. The first manifestations of a Neoclassical sensibility appeared in his designs of 1906 and reflected the proportions and cylindrical silhouette of the Directoire. It was classicism through the lens of the eighteenth century. When he held his "Les Festes de Bacchus" party in 1912, however, a more historical approach informed his designs. 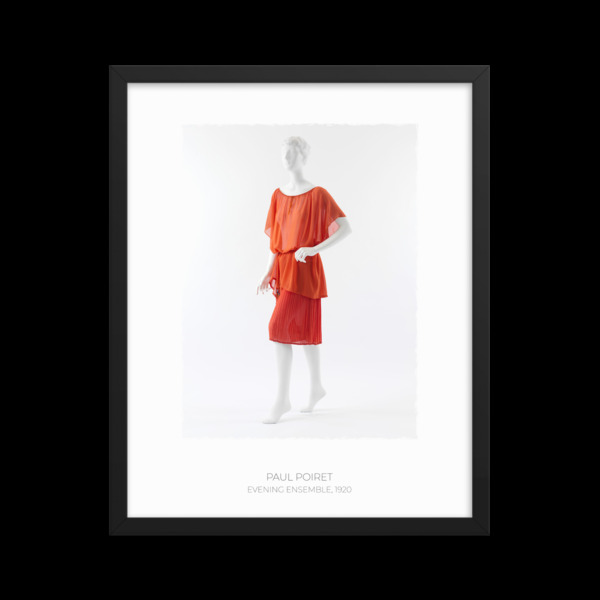 Although Poiret’s classicism was allusive rather than academic, it still functioned as an implicit advocacy of the free, unfettered body. While this nightdress ensemble is similar to his design of the chiton for his "Les Festes de Bacchus," Poiret constructed it like a poncho, from a rectangle folded at the shoulder line. Poiret then stitched it at either side seam. The matching shorts are made of two pieces of pleated crepe seamed together at center front and center back with a supporting hip yoke. The yoke is attached to the legs of the shorts by thread brides that create the effect of pulled work, or fagotting, a feature suggestive of deluxe lingerie. The vivid red orange of the ensemble might evoke the red terracotta ground associated with Greek vase painting, but a tiny detail, the bead-weighted, tassel-trimmed waist cord, suggests Chinese lacquer and cinnabar as likely sources. The modernity of the ensemble is conveyed by Poiret's blending of orientalism and classicism.